I hope you are all enjoying the apocolypse. Remeber kids, zombies were people too. I recently posted about my obsession with gradient manicures. I had a few requests for a video tutorial (which I still might do once the holidays are over). I need an assistant to do a video tutorial, so I decided to do a photo tutorial instead. 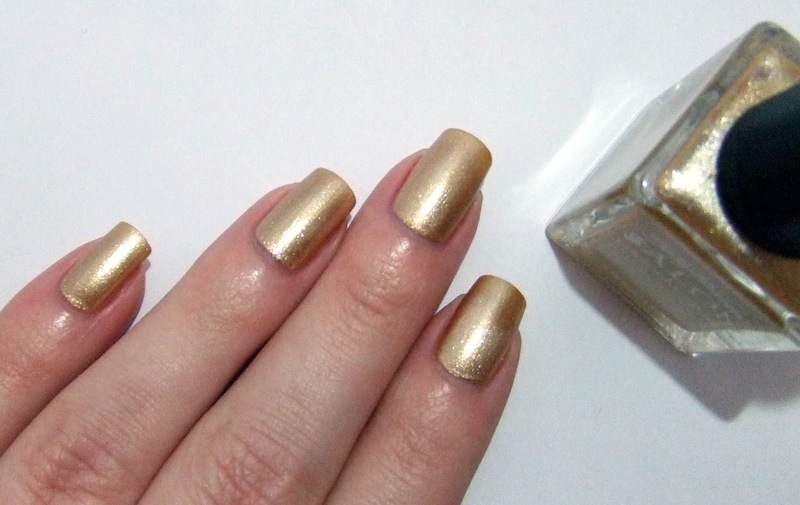 It seems like this is a pretty tricky manicure to master for some people. There are tons of how-to's out there, all seemingly different and "super simple!" This really is a simple manicure once you get the hang of it, it's just a matter of practice. The sponge doesn't have to be wet. Some tutorials I've read say otherwise, but in my experience it doesn't make a whole lot of difference. Sometimes I wet the sponge, sometimes I don't. It's up to you. Polishes with similar finishes work the best. Pearly with pearly, cream with cream, etc. My favorite is pearly/metallics because they really are the most forgiving. 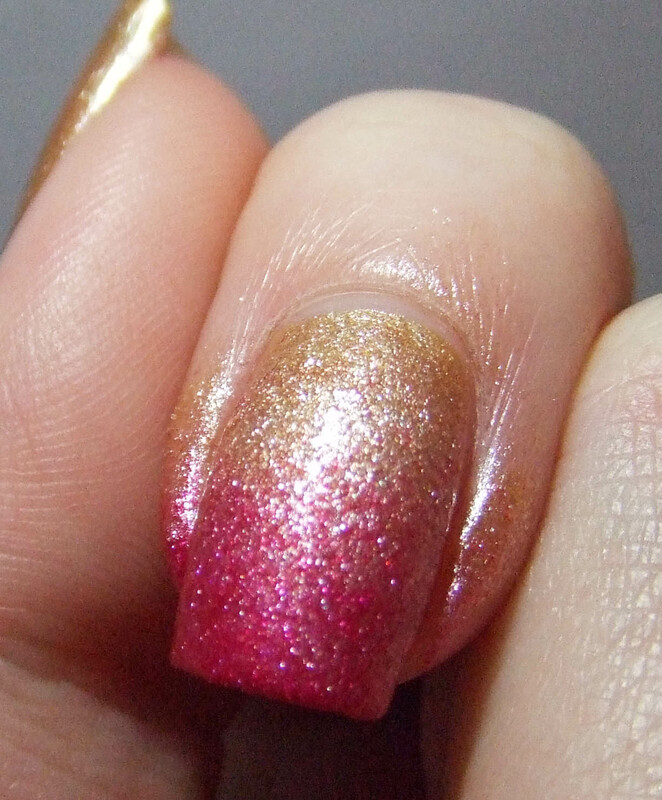 The sparkle will cover any spots that didn't blend well. When in doubt, add glitter! Glitter really does make everything better, I promise. 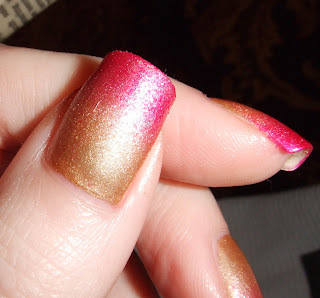 My very first gradient was much improved by a healthy coat of China Glaze Fairy Dust. 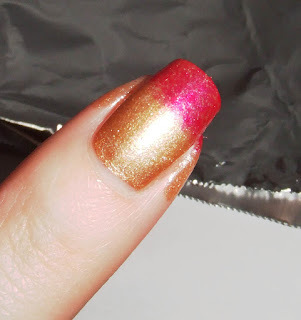 Add your topcoat when you are done with the whole hand. It really will help hide the weirdness left over from the sponging. So this is what I'm going for. A shimmery, sparkly gradient that is fairly well blended together. This would have been a 20 minute manicure if I hadn't taken so many pictures. 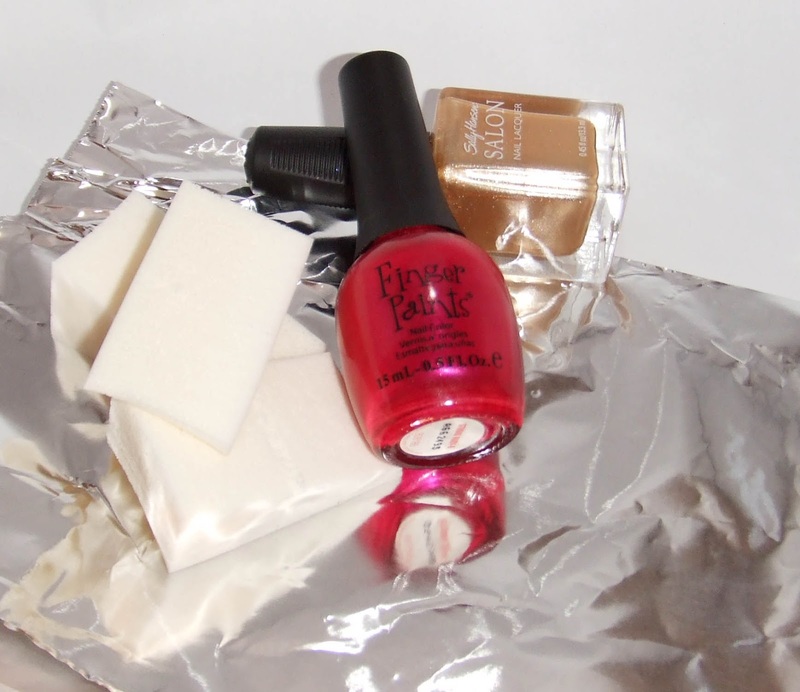 Gather your supplies: two bottles of nail polish, a few sponges, and a piece of foil/paper plate/junk mail. We'll need it for blotting, so anything that won't soak up the polish will work. Pictured above: Fingerpaints Studio Ruby-o and Sally Hansen Gilty Pleasure. Paint your basecoat, your polish, and top coat. I used two coats, but you use however many you need to get your basecoat opaque. Or not, depending on what your desired result is. The topcoat is important here. If you make a mistake with the gradient, the topcoat allows us to remove the second color without having to redo the base color. Basecoat, two coats of Gilty Pleasure, and a nice coat of Insta-dri. Once your base is COMPLETELY dry, get your sponge handy. Paint two stripes of polish on the end of the sponge. 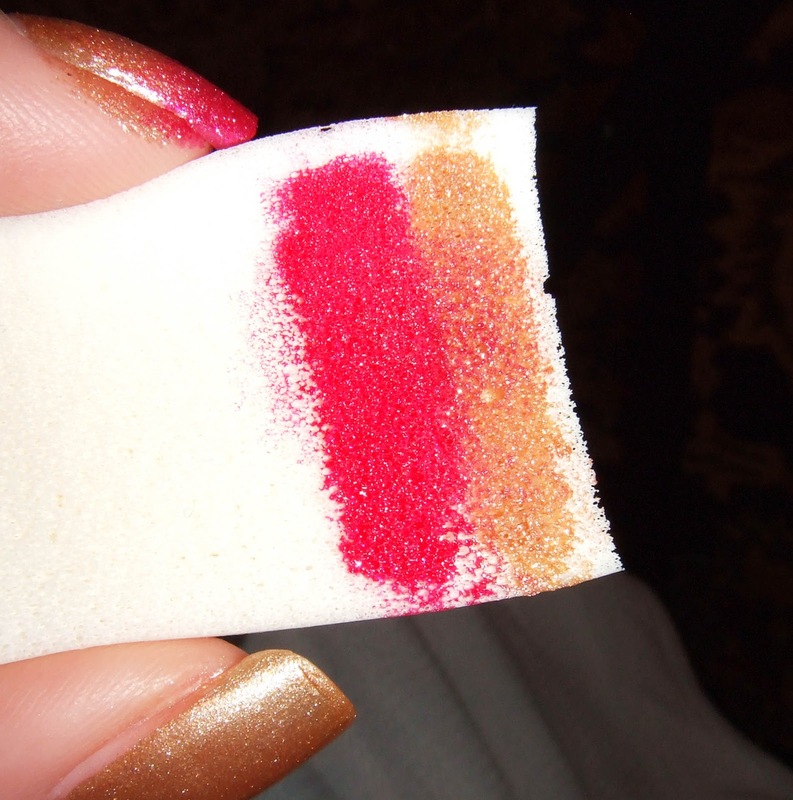 Whichever color you want at the tips goes furthest from the edge. Blot it a few times on your foil. 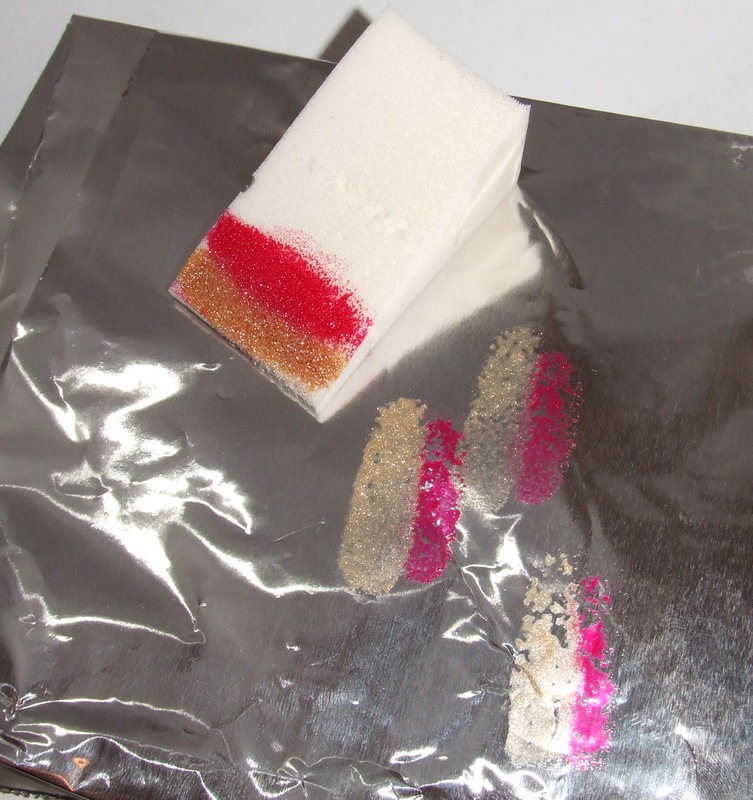 Keep blotting, moving the sponge each time you make contact. Think of it like "a step forward, a step back". The idea is to blend the colors as best we can. If you don't feel there is enough color, you can always add some more. 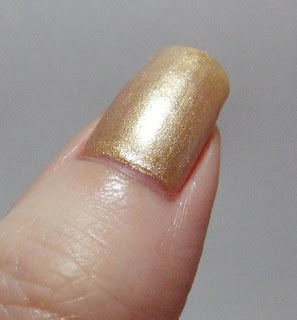 The beauty of this particular manicure is that it is super forgiving. blotted, but no topcoat. It looks a little rough, but that is mostly because I forgot to blot. 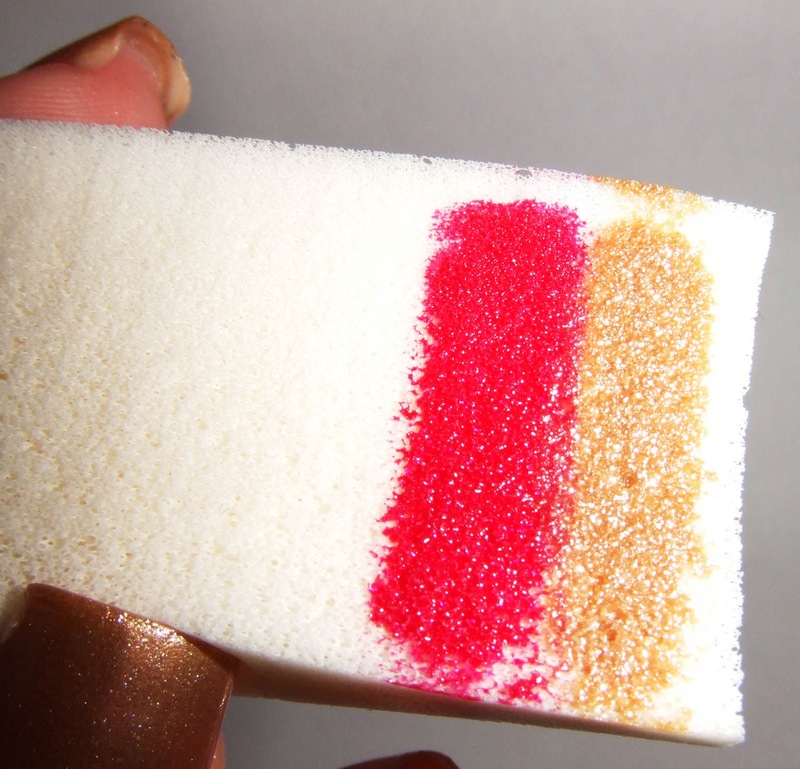 This is what your sponge will probably look like after the first nail. The colors do get a bit muddy, but it shouldn't be a big deal. I use the same side of the sponge for my whole hand. I think that the last finger always looks better than the first. Continue on to the whole hand. By the pinky finger, you'll probably have a decent idea of what you are doing. It's not really rocket surgery, it's just practice. Once you are done, go ahead and apply your topcoat. It should help blend the colors a little more smoothly. Don't worry. No big deal. If you applied a topcoat to your base color, you should be able to take an acetone saturated cotton ball and gently wipe off the color. 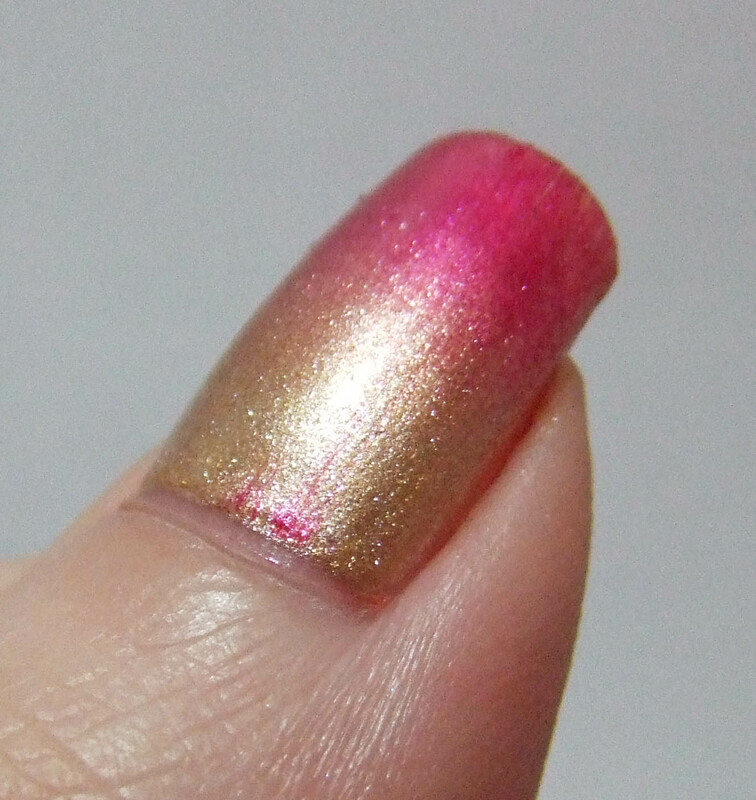 And then just re-do the gradient. I think this is my favorite nail art because while it looks really complicated and awesome, it is dead-easy to do in a short amount of time. Plus, mistakes are so easily corrected. Not like when you spend all day making dots/stripes...and the topcoat drags! Final result (again). I mentioned earlier that I forgot to blot on the first finger (my index). 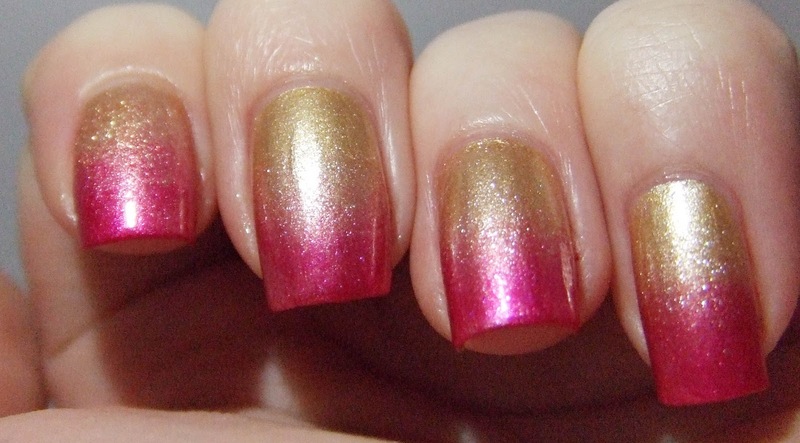 You can kind-of tell that the colors aren't as blended on that finger as they are on the following ones. It's really up to you if you want to blot. I think it looks better, but you may not. great tutorial, will definitely try this out!! I'd love to see pictures!